If your looking for a band to provide live music for you venue / event then you've come to the right place. Based in Sussex, Banquet can perform over the UK / Europe and have their own lighting and sound system to provide you with the full entertainment package. 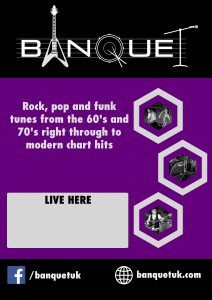 Banquet is a professional covers band based in Sussex UK. The band is made up of professional musicians ensuring a fantastic performance every time they play. Use the menu tabs to find out more or to contact Banquet CLICK HERE. Check out Banquet playing live on our Media Page. Banquet perform all types of events such as weddings, corporate, private parties, pub gigs, etc. Click on the links below to ope either A4 or A3 PDF posters in a new tab. They can be downloaded and/or printed from there.